ONGC Petro additions Limited (OPAL) is looking for result oriented, dynamic, experienced Executive and Non-Executive professionals with proven track record in Petrochemical/related Hydrocarbon industry for various roles across all functional domains. Competent candidates apply online from 10th October 2015 to 25th October 2015. 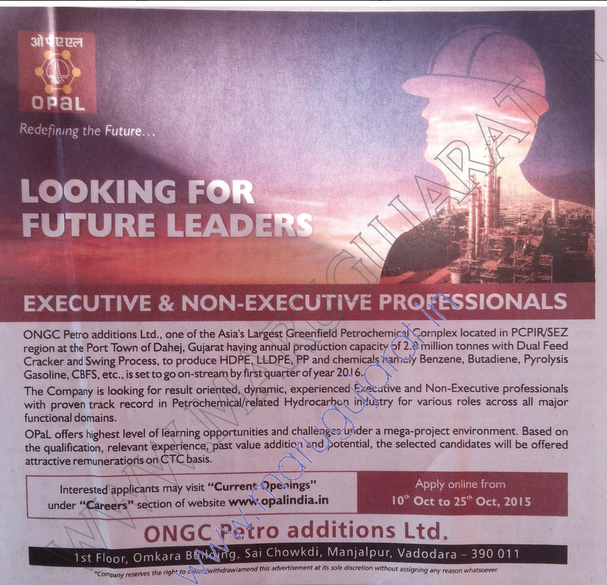 Interested applicants may Apply Online through OPAL India Website from 10-10-2015 to 25-10-2015.